"A different way to eat your potatoes! The batter makes your ordinary spuds spicy and delicious for a Pakistani-style snack. Try this with sliced eggplant as well!" Whisk gram flour, salt, cayenne pepper, cumin seeds, and baking powder together in a bowl. Stir lukewarm water into flour mixture, 1/2 cup at a time, until batter has a thick pancake-batter consistency. 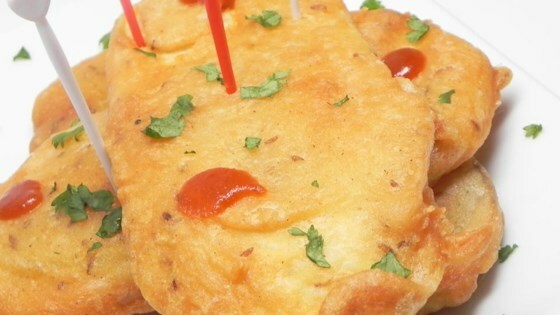 Dip potato slices in batter until well-coated. Working in batches, cook coated potatoes in hot oil, turning once, until golden and crispy, 2 to 4 minutes. Transfer potatoes to a paper-towel lined plate to drain.